German tosafist, codifier, and liturgical poet; born at Worms about 1215; died in the fortress of Ensisheim, Alsace, May 2 (April 27 old style), 1293. He belonged to a family which was noted for its scholars; and in his responsa he designates about a dozen Talmudic authorities of his time as his relatives. The epitaph, still extant, of his father, who died (1275) at a very advanced age, praises the latter's extraordinary piety, eminent scholarship, brilliant gift of oratory, and great popularity. It may be assumed, therefore, that Meïr received his earliest instruction from his father, though his first teacher proper was Isaac b. Moses of Vienna, under whom, as well as under Samuel b. Menahem, he studied at Würzburg. 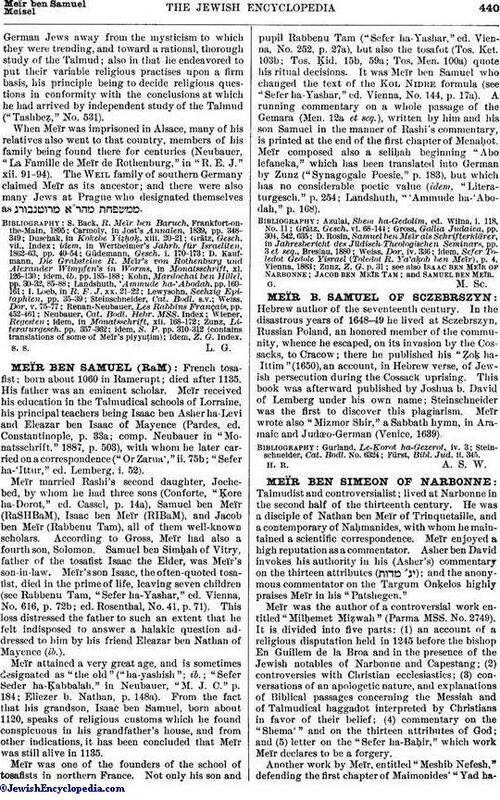 Meïr studied at the French yeshibot also, his teachers there being Jehiel b. Joseph of Paris, Samuel b. Solomon of Falaise, and Samuel of Evreux. On his return to Germany he quickly gathered around him a band of devoted pupils, including many married men, who left their families for a time in order to listen to so brilliant a teacher. It is difficult to determine Meïr's actual official position among the German rabbis of his time. Modern historians maintain that he was chief rabbi of Germany, elected by the communities and confirmed by Emperor Rudolph. It is very doubtful, however, whether at this time the office of chief rabbi existed in Germany; and even if it did, there is nothing to prove that Meïr occupied it. The designations "Chief" (Responsa, ed. Prague, No. 946), "Father of Rabbis," etc., merely indicate that on account of his great scholarship he was everywhere recognized as the spiritual leader, whose decrees and institutions were considered as authoritative. As far as is known, he officiated as rabbi in the following communities: Kostnitz, Augsburg, Würzburg, Rothenburg, Worms, Nuremberg, and Mayence. This order of enumeration is probably chronological; but nothing is known of Meïr's terms of office in the different cities. As he is generally called Meïr "of Rothenburg" (Rothenburg-on-the-Tauber), he probably stayed longest in that city. Meïr was well-to-do, perhaps rich; for, according to his own account, he had in his house at Rothenburg separate apartments for winter and summer, with an airy dining-room, and separate rooms for each of his pupils. Meïr's decisions in questions of taxation regulated the financial conditions of the Jewish communities of Germany. Thus he decided that no member of a community should be permitted to negotiate with the authorities in matters of taxation, as this might be detrimental to the community (ib. No. 134). When Emperor Rudolph presented his son Albrecht in 1282 with Austria, Styria, and Carinthia, the communities of those districts refused to pay their portion of the taxes to the federation of communities of the empire, on the ground that they now belonged to a different state. Meïr decided that the refusal of the communities to contribute to the general tax fund could be justified only if the emperor gave up those countries entirelywithout claiming any part of their revenues (ib. No. 131). Another important decision of Meïr's had reference to the ransom of Jews, who were frequently imprisoned at that time for the purpose of extorting money from them. He decided that the ransomed Jews must reimburse the community in every case; and that the latter, in case of need, was not only justified in taking, but was in duty bound to take, the property of the prisoners, even against their will, for ransom. He based his decision on the ground that in such cases the ransom was not a private matter, but concerned the Jewish communities, and that the individual ought therefore to be compelled to give up his property for his release, although he personally might prefer prison to poverty. Meïr himself was soon to experience what life in prison meant. His seizure, imprisonment, and sad death have made too deep an impression on the Jews to be a matter for doubt; moreover, contemporaneous Christian writers confirm the chief incidents of the story. However, as some highly important points are not clear, it may be best to give here the following concise account: "R. Meïr b. Baruch was about to go abroad with his wife, his daughters, his sons-in-law, and all his family, and had proceeded as far as a city in the mountains of Lombardy, where he intended to stay until all his traveling companions had gathered about him, when suddenly the wicked Bishop of Basel passed through the city on his journey from Rome, accompanied by a baptized Jew named Kneppe [ ]. The latter recognized Meïr and informed the bishop, who brought it about that the lord of that city, Count Meinhard of Görz, seized Meïr on the fourth of Tammuz [= June 28], 1286, and delivered him to Emperor Rudolph, who cast him into prison" (marginal glosses to folio 85 of the "Minhagbuch" of Worms, written in 1625, quoted by Lewysohn, "Sechzig Epitaphien," p. 36; comp. also S. Back, "R. Meïr ben Baruch," pp. 62 et seq.). Neither the object of his journey nor the actual reason for the imprisonment is given in any source; but modern historians have attempted various explanations. The condition of the Jews of Germany was such toward the end of the thirteenth century that they were not for a moment sure of their lives and property. Murder, pillage, arson, and extortion were of daily occurrence. Under these circumstances many Jews emigrated; and Palestine especially attracted the fugitives from Germany, as in that country very favorable conditions obtained for the Jews during the reign of the Mongolian khan Argun and his Jewish minister Sa'd al-Daulah. It is assumed that Meïr was leading such a band of emigrants, and that he was imprisoned by the government in order to put a stop to this movement, which, if continued, would have materially injured the imperial treasury. The account of a young contemporary of Meïr, who was in very close relations with him, seems to indicate, however, that Meïr had entirely different reasons for emigrating. He says that the emperor demanded a great sum of money from the Jews, which the latter would not or could not pay, and that consequently their leader feared—and justly so, as the sequel showed—that the emperor would seize him as a hostage ("Ẓawwa'at R. Yehudah b. Asher," ed. Schechter, in "Bet Talmud," iv. 374). After his seizure Meïr was probably first taken to Wasserburg ( ), a German locality that can not now be identified, and then transferred to the fortress of Ensisheim in the district of Colmar, Upper Alsace. The Jewish communities of course did everything to secure the liberation of their greatest teacher; but the ransom demanded by the government-30,000 marks, according to one report—was such an exorbitant one that the negotiations dragged. A later authority, frequently well informed in matters of history (Solomon Luria, "Yam shel Shelomoh," to Giṭ. iv., No. 66), says that Meïr himself prevented any such high sum being paid for his liberation lest the government should repeat this expedient of imprisoning important men for the purpose of extorting money. He therefore remained in prison from June 28, 1286, until his death (1293). He bore his seven years of captivity heroically. In the beginning he was consoled by the hope of a speedy release; and later on he submitted in the thought that it was the will of God, whose ways are always just. Even in prison he was occupied solely with studying and teaching. He wrote, or revised, a large part of his works; and his responsa now took the place of oral instruction. Meïr was a voluminous writer. His works include: (1) Tosafot to several Talmudic treatises. Passages are quoted therefrom to Berakot, Shabbat, 'Erubin, Yoma, Giṭṭin, Nedarim, Baba Ḳamma, Baba Meẓi'a, Baba Batra, Shebu'ot, Menaḥot, and Ḥullin. The tosafot to Yoma in the editions are those of R. Meïr, and are the only tosafot of his that have been printed. (2) Responsa, of which various parts have appeared (Cremona, 1537; Prague, 1608; Lemberg, 1860; Berlin, 1891). (3) "Hilkot Berakot," or "Seder Berakot," regulations for the various formulas of blessings to be pronounced in performing certain actions. The book is frequently cited in the works of Meïr's pupils, and is probably identical with the "Birkot MaHaRaM," issued in 1558 in Riva di Trento. (4) "Hilkot Sheḥiṭah," regulations for the ritual slaughtering and subsequent examination ("bediḳah") of animals, in manuscript in the Bodleian Library, Oxford (Neubauer, "Cat. Bodl. Hebr. MSS." Nos. 1171, 2275). (5) "Hilkot Abelut," or "Hilkot Semaḥot," on mourning customs. This work, somewhat abbreviated, is included also in the "Mordekai" to Mo'ed Ḳaṭan; but in all the passages where the author speaks in the first person, the third person has been substituted, so that here Meïr's work appears everywhere in quotation. Judah b. Nathan ha-Levi edited and published this work under the title "Sefer Maḥaneh Lewiyyah," Leghorn, 1789. (6) "Halakot Pesuḳot," decisions on various subjects, in manuscript at the Bodleian (Neubauer, l.c. No. 781, 2a). This library contains also various collections of Meïr's decisions (Neubauer, l.c. Index). (7) "Pisḳe 'Erubin," short summary of the Talmudic-rabbinical regulation of the 'erub. (8) "Hiddushim," novellæ to various treatises of the Talmud. Azulai possessed a copyof this work. (9) Minhagim of ritual ceremonies in the synagogue, in manuscript in the Vatican and Bodleian libraries. (10) Treatise on the marital duties of husband and wife, in manuscript in the Vatican Library. (11) Commentary on the sixth order of the Mishnah, of which there have been published in Romm's edition of the Talmud (Wilna, 1897) the commentaries to the treatises Nega'im and Oholot, from an Oxford manuscript, and fragments of the rest from citations in Lippman Heller's Mishnah commentary. (12) Masoretic notes, in manuscript in the Vatican and Oxford libraries. It is not improbable that Meïr was the author also of the "Liḳḳuṭe ha-Maimuni," found in the Austrian manuscript of the "Mordekai" (see Mordecai b. Hillel), and consisting of very brief extracts from Maimonides' "Yad," with occasional decisions by other authors referring to the subject or short remarks by the author himself. Meïr is not, however, the author of the cabalistic-ethical works "Sefer Emunot" and "Be'er Mayim Ḥayyim," which are ascribed to him by some scholars. Meïr was also a voluminous liturgical poet, nineteen of his poems being included in the German Maḥzor. On account of his great authority as a Talmudist, his compositions were included even in the liturgy of the Day of Atonement and of the Ninth of Ab. Although Meïr was a German, he modeled his poems upon those of Judah ha-Levi, without, however, equaling them. Still his piyyuṭim show great command of language, and to a certain extent true poetic inspiration also. The best-known among his poems is his dirge on the public burning of Hebrew books at Paris in 1244, composed in the strophic rime of Judah ha-Levi's "Zionide," and rivaling its model in warmth of imagination and depth of feeling, though much inferior to it in purity of language and in versification. Meïr likewise wrote commentaries on earlier piyyuṭim, being probably encouraged to do so by his father, who himself wrote such comments (Zunz, "Ritus," pp. 195, 199). The great authority which Meïr enjoyed during his life increased rather than lessened after his death. Aside from Rashi and Rabbenu Gershon, he is the only one upon whom the honorary title "Me'or ha-Golah" (= "Light of the Exile") has been conferred. It would be difficult to overestimate his influence on the development of the religious life of the Jews of Germany. He is also one among the few Germans whose authority extended far beyond the limits of their own country, and that not only during their lives—even Solomon ben Abraham Adret, the greatest Spanish Talmudist, consulted Meïr on difficult questions—but also for generations afterward. Meïr's renowned pupil, Asher ben Jehiel, introduced the teachings of his master into Spain and Portugal. The great influence which Meïr exercised upon the religious life of the Jews was chiefly personal, acting directly upon his pupils, who on their part endeavored to perpetuate the authority of their master. In addition to Asher ben Jehiel, especially noteworthy among Meïr's pupils were Mordecai b. Hillel and Meïr ha-Kohen, who were largely instrumental in establishing his authority through their widely circulated compendiums of the Law. Through the works of these pupils it is possible to form an opinion of Meïr's importance, although most of his works, with the exception of the responsa, either have perished or remain unpublished. 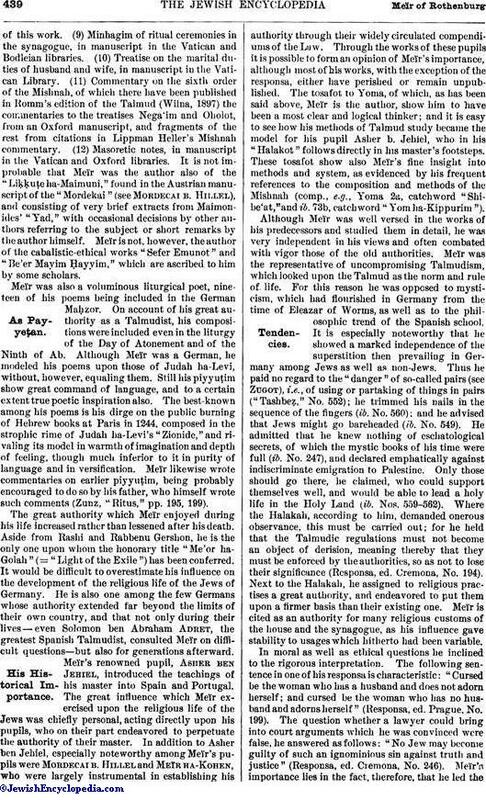 The tosafot to Yoma, of which, as has been said above, Meïr is the author, show him to have been a most clear and logical thinker; and it is easy to see how his methods of Talmud study became the model for his pupil Asher b. Jehiel, who in his "Halakot" follows directly in his master's footsteps. These tosafot show also Meïr's fine insight into methods and system, as evidenced by his frequent references to the composition and methods of the Mishnah (comp., e.g., Yoma 2a, catchword "Shibe'at," and ib. 73b, catchword "Yom ha-Kippurim"). Although Meïr was well versed in the works of his predecessors and studied them in detail, he was very independent in his views and often combated with vigor those of the old authorities. Meïr was the representative of uncompromising Talmudism, which looked upon the Talmud as the norm and rule of life. For this reason he was opposed to mysticism, which had flourished in Germany from the time of Eleazar of Worms, as well as to the philosophic trend of the Spanish school. It is especially noteworthy that he showed a marked independence of the superstition then prevailing in Germany among Jews as well as non-Jews. Thus he paid no regard to the "danger" of so-called pairs (see Zugot), i.e., of using or partaking of things in pairs ("Tashbeẓ," No. 552); he trimmed his nails in the sequence of the fingers (ib. No. 560); and he advised that Jews might go bareheaded (ib. No. 549). He admitted that he knew nothing of eschatological secrets, of which the mystic books of his time were full (ib. No. 247), and declared emphatically against indiscriminate emigration to Palestine. Only those should go there, he claimed, who could support themselves well, and would be able to lead a holy life in the Holy Land (ib. Nos. 559-562). Where the Halakah, according to him, demanded onerous observance, this must be carried out; for he held that the Talmudic regulations must not become an object of derision, meaning thereby that they must be enforced by the authorities, so as not to lose their significance (Responsa, ed. Cremona, No. 194). Next to the Halakah, he assigned to religious practises a great authority, and endeavored to put them upon a firmer basis than their existing one. Meïr is cited as an authority for many religious customs of the house and the synagogue, as his influence gave stability to usages which hitherto had been variable. In moral as well as ethical questions he inclined to the rigorous interpretation. The following sentence in one of his responsa is characteristic: "Cursed be the woman who has a husband and does not adorn herself; and cursed be the woman who has no husband and adorns herself" (Responsa, ed. Prague, No. 199). The question whether a lawyer could bring into court arguments which he was convinced were false, he answered as follows: "No Jew may become guilty of such an ignominious sin against truth and justice" (Responsa, ed. Cremona, No. 246). 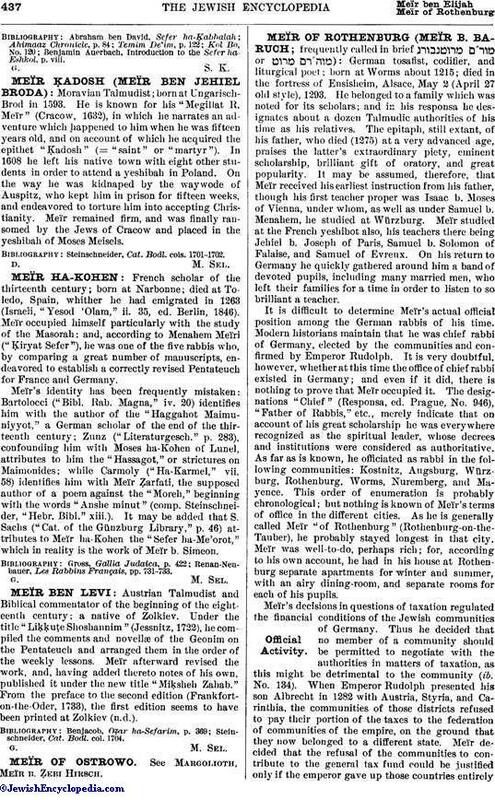 Meïr's importance lies in the fact, therefore, that he led theGerman Jews away from the mysticism to which they were trending, and toward a rational, thorough study of the Talmud; also in that he endeavored to put their variable religious practises upon a firm basis, his principle being to decide religious questions in conformity with the conclusions at which he had arrived by independent study of the Talmud ("Tashbeẓ," No. 531). When Meïr was imprisoned in Alsace, many of his relatives also went to that country, members of his family being found there for centuries (Neubauer, "La Famille de Meïr de Rothenburg," in "R. E. J." xii. 91-94). 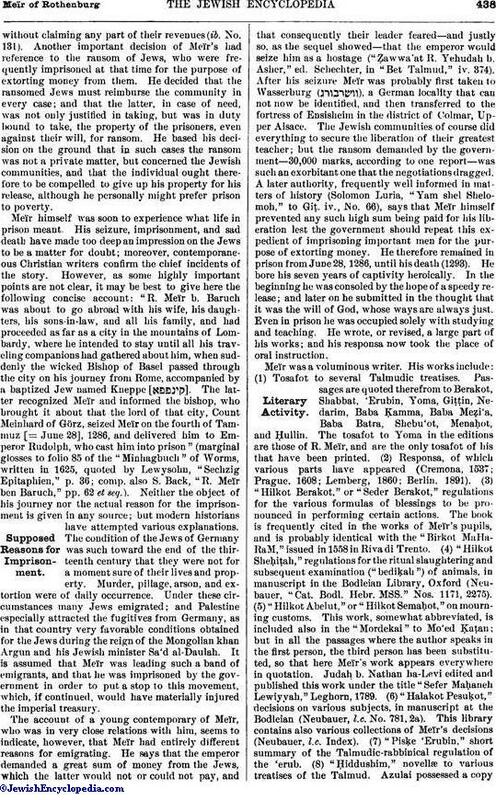 The Weil family of southern Germany claimed Meïr as its ancestor; and there were also many Jews at Prague who designated themselves as . idem, S. P. pp. 310-312 (contains translations of some of Meïr's piyyuṭim), idem, Z. G. Index.